You know those days where you close your eyes and wish you could just turn back the clock a little bit? That’s what I’m feeling right at this moment – wishing it was this time last Friday, so I could be back in Sonoma. What an amazing place! This was my first trip to Northern California (most of trips West are L.A. bound), but it certainly won’t be my last. I went with my boyfriend, his family, and my little sister (she’s the brunette in the beige sweater with me in the picture). What a group! We had so much fun visiting various vineyards and learning all about wine. My favorite tour was the Schramsberg Vineyards. After all, who doesn’t love to learn (and taste!) more about champagne? Here are a few snapshots of the trip. I hope you all have a fabulous weekend! It looks like you had a lovely time, gorgeous photos! Have a wonderful weekend. I have been dying to go to wine country! Looks incredible. And PS I have the same shirt and bag 🙂 worth them both yesterday. love love love the Celine! We hope to one day make that same trip. Looks amazing! FUn pictures! Glad that you had a great time! and I love everyone's outfit! 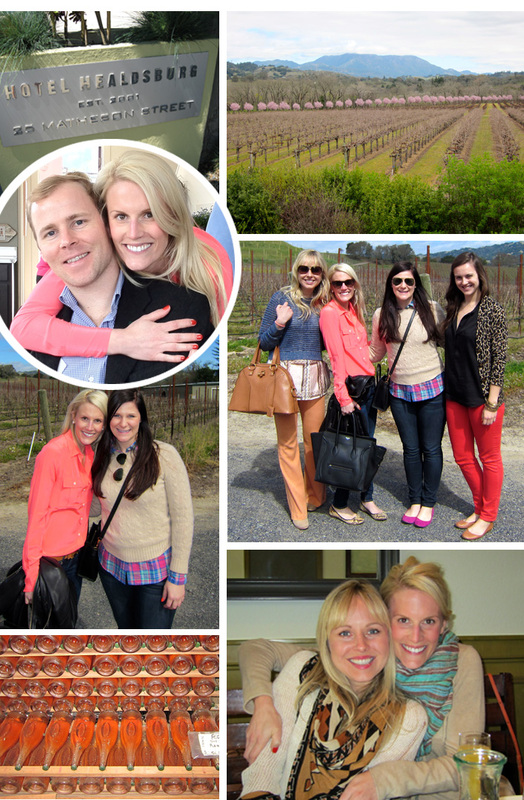 Love Sonoma! I'm a lucky one, my parents live in Napa and my dad works in the wine industry. Next time you go, let me know. I can give you some tips and help set up some private tours and tastings or something! !